It's another edition of A Time to Stitch (ATTS), round SIX, hosted by two lovely and talented ladies, I have the pleasure to call my friends: Therese, from Therese's Treasures, and Christine, from One Kiss Creations. I was super excited about this round of ATTS because the objective was to follow a chart, and Therese and Christine were kind enough to highlight Bead-It-Forward, a charitable project I took over last year!! Here was a blurb about it in the latest Bead&Button. Featuring a picture of some squares done by one of the beaders in Operation Tackle That Bead Stash, and the pattern was one that I created for last year's sea them! I had the pleasure of visiting one of Bead-It-Forward's beneficiaries earlier this week, the Virginia Thurston Healing Garden. The staff there was very excited to learn about the project and really enjoyed looking at (and touching - no one can resist) the squares. After I explained that the deadline for squares was coming up in March and I expected to see hopefully hundreds, if not thousands of squares, one woman there asked me, "Who has the privilege of putting the squares together?" I responded to her by saying, "Thank you for positioning it like that, because I really do feel like it's a privilege and an honor to get to see and touch every one of these squares and then get to help decide which ones will look good together!" The visit bolstered my enthusiasm for this project, and it was great to have a group of non-beaders ooh and aah over the squares! Not to mention, the Healing Garden is an exceptional facility providing complementary care and support to cancer patients. Anyone submitting a square to Bead-It-Forward should feel absolutely great about the fact that the Healing Garden is going to benefit from the square(s) created!!! Recently I held a contest for Bead-It-Forward patterns. One of our hosts sent in a handful - thank you, again Therese!!! And also another southern gal, Stephany from North Carolina, made some patterns. Here is her blog http://foggymountaindesigns.blogspot.com/ if you want to check out some of her creations of following her own chart. In the meanwhile - here is a list of participants for this round of A Time To Stitch. THANK YOU AGAIN TO Therese and Christine for hosting this FUN blog hop/challenge! You guys do such a great job with those squares. Happy New Year, Amy! I think it's wonderful that you've taken on the Bead It Forward project! You are certainly to be commended for giving your time so freely. It's wonderful that there are people like you in the world. Your squares are fantastic! 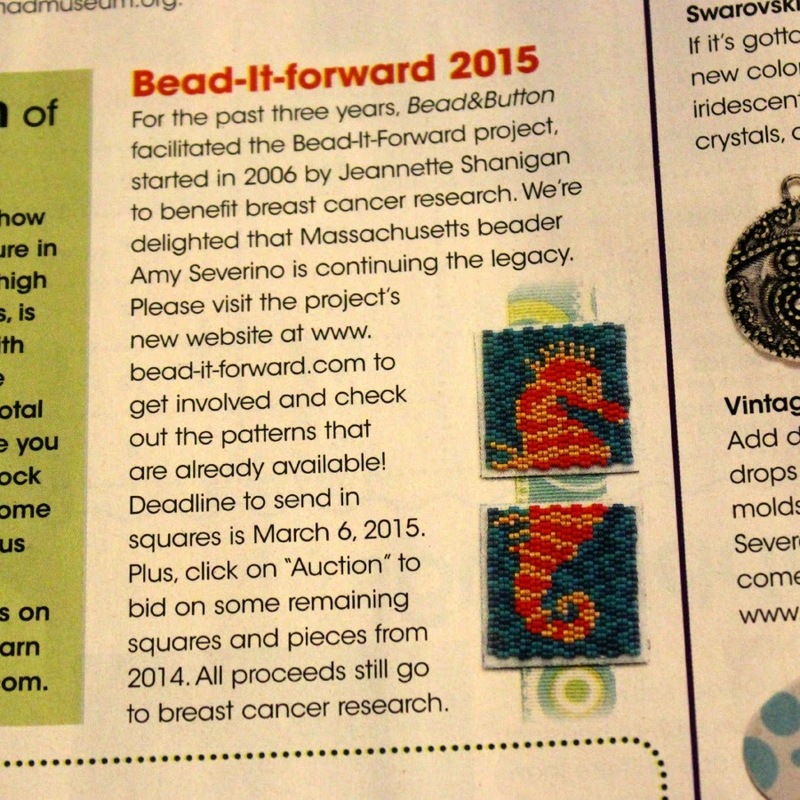 Hi Amy, I was so glad to see the article about this year's Bead-It-Forward in Bead & Button. And what a great idea for this challenge. I was sad to hear about the reason for the increase in your square honorees, however. It's a wonderful gift you offer - herding all us "beady cats" for the event. Thank you! 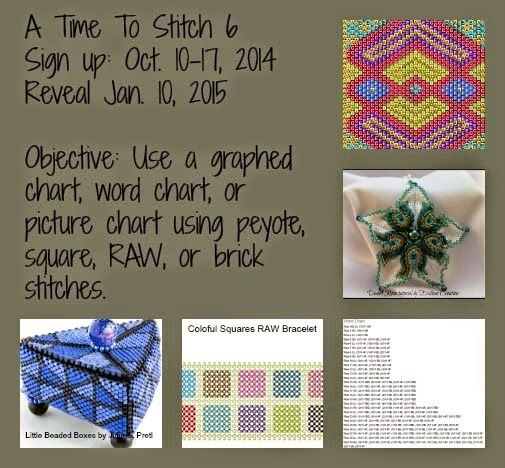 Your squares are great, this is such a great cause to work for ! Thank you for participating in this ATTS6 challenge, also thank you for allowing us to use the bead-it-forward patterns in the challenge. I have enjoyed making and beading the squares and I plan on doing more of them before the deadline. 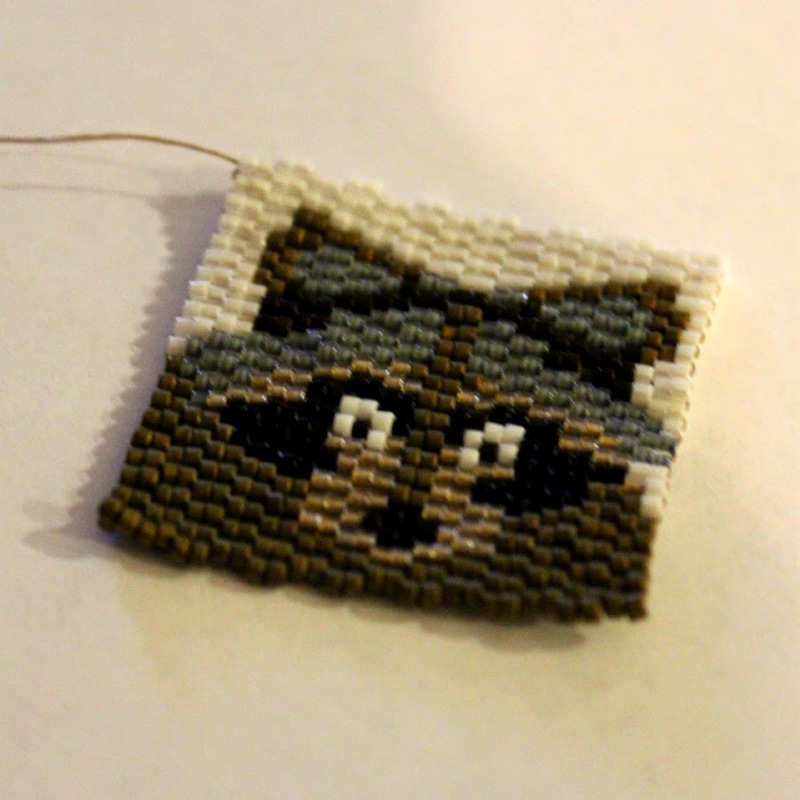 The raccoon is so cute and I love the dragonfly, these two are on my list of to do squares. I, like Paula, am sad to hear that the number of your square honorees has increased, hopefully it will not get larger than 8. You are a wonderful person and it is a pleasure to call you a friend. Amy, thank you so much for allowing us to use your bead patterns. They made this whole process easier for me, that is for sure :-) What a lovely experience you had going to the Healing Garden. There is even more love going into your squares after being there, I am sure. I belong to a gym for people who have had cancer...mostly women attend and most have had breast cancer. The numbers are sadly staggering. Your squares are wonderful ~ love that little raccoon! And the dragonfly...what great colors ~ it pops against that white background! Thank you for your friendship...I have cherished how it has grown over the past few years. Oh and I looked at Stephany's site...I love her wolf howling at the moon!!! Hi Amy, congratulations on continuing the legacy of Bead-it-Forward!!! You know research on cancer has a particular meaning for me (even if not exactly breast cancer). What a fantastic project, Amy and you are such an enthusiastic ambassador. Fantastic squares - so inspired by both your earthy raccoon and the ethereal dragonfly, and by the obvious love and care that went into them! Hi Amy, Thank you for hosting the Bead-it-forward project. I have participated for 6 years now. This is dear to my heart as both my Mom and sister have gone through breast cancer. I feel privileged to be part of this. 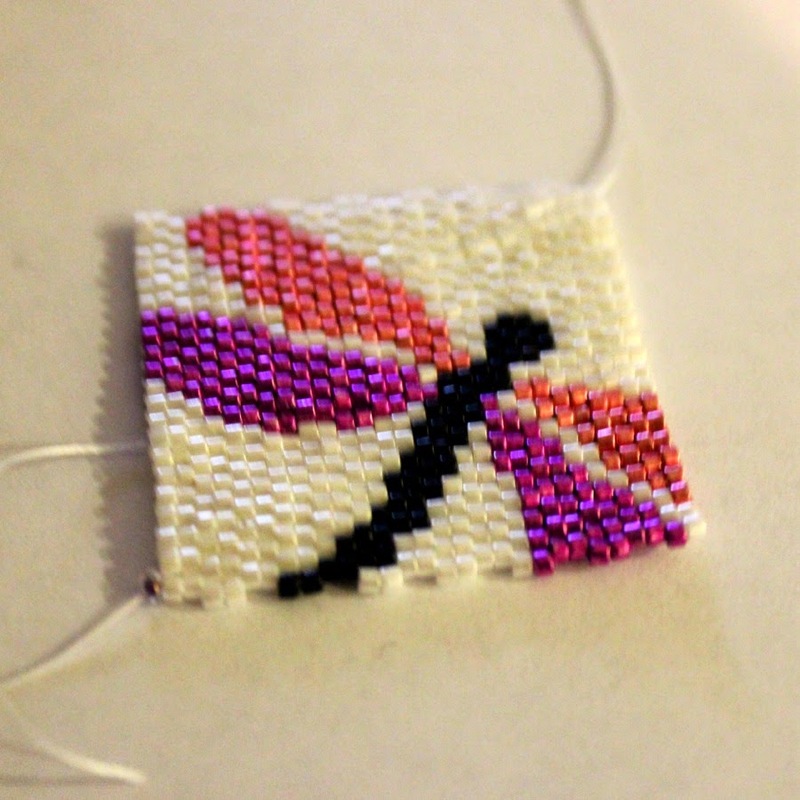 I have one square done and I showed it at my last bead group meeting. I will be turning in several squared after our next meeting. I am hoping to get another square done myself also. Your square are beautiful. The racoon face is adorable. I did a necklace for this challenge but I will do a post featuring my square (which is a lion) in the next few days. Great project Amy and you are the perfect person to be in charge...so talented, so generous and just an all round awesome person! Love your squares! your squares are beautiful and what a wonderful thing you do working so hard for the charity. Well done you, we need more people like you in this world. WOW! What a great project, "bead-it-forward", that's wonderful that you are stepping up to continue the project! And it sounds like you had a wonderful experience at the Healing Garden. It's amazing that something as simple as a little square can bring so much together and create an environment of hope! Oh I almost forgot, your squares are great too!! Beautiful beading! Your bead it forward squares are wonderful. That raccoon is so cute. Meaningful projects like this are so important. When art reaches out and touches so many lives it's inspiring. The squares you made are beautiful. What a gorgeous little raccoon and what a wonderful cause.